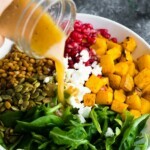 Havest lentil salad has roasted butternut squash, arugula, pomegranates, goat cheese and pumpkin seeds. Make a meal out of it or serve as a side dish. I am a big fan of the ‘big salad’. My ideal ‘big salad’ is packed full of goodies including veggies, protein, something sweet, something crunchy, and cheese. This harvest lentil salad is my latest big salad addiction! 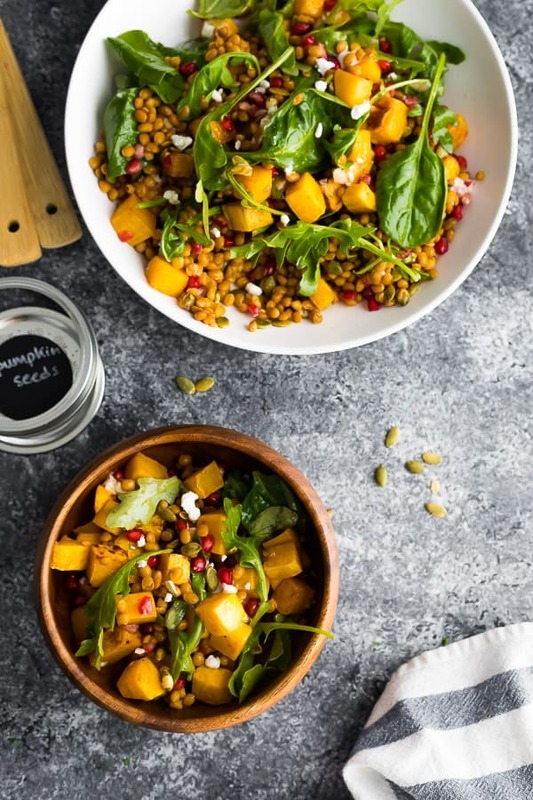 Full of delicious goodies including butternut squash, pumpkin seeds, pomegranates and goat cheese, it is great served as a main course but also makes a delicious side salad as well. 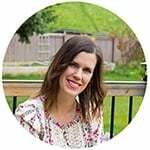 Let’s talk about this harvest lentil salad! I used canned lentils to cut back on the prep time. You can cook your own from scratch, if you’d like, just stay away from red lentils which tend to get mushy. I’d go for brown lentils and use this tutorial to cook them! roast butternut squash. I used this Maple Cinnamon Roasted Butternut Squash recipe and it added a nice dimension of flavor to the recipe. shake together the vinaigrette. I used my favorite White Wine Vinaigrette recipe but added a smidge of cinnamon to just give this salad a more ‘fall’ flavor. de-seed your pomegranate. Here’s a video tutorial showing how I de-seed my pomegranates…it makes really quick work of it! toss everything except the goat cheese together- don’t do this step until just before serving. sprinkle with goat cheese last so it doesn’t dissolve into the dressing. What lentils can I use for this cold lentil salad? I used canned brown lentils. I think green lentils would work great as well, but stay away from red lentils which can tend to get mushy. How long does this cold lentil salad recipe keep? Unfortunately this one doesn’t keep for very long, which is why I recommend only adding the dressing just before serving. 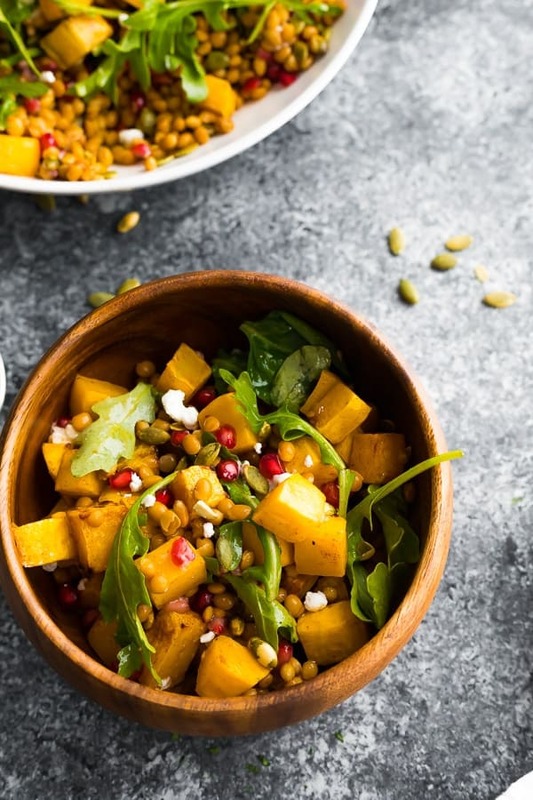 If you’re looking to meal prep this salad, you can pre-roast the butternut squash, de-seed the pomegranate and shake up the dressing 2-3 days ahead, then assemble when you’re ready to eat. What can I serve with this harvest lentil salad? it would be fantastic as part of your Thanksgiving or Christmas menu! Check out my post on How To Open a Pomegranate for tips and a video! 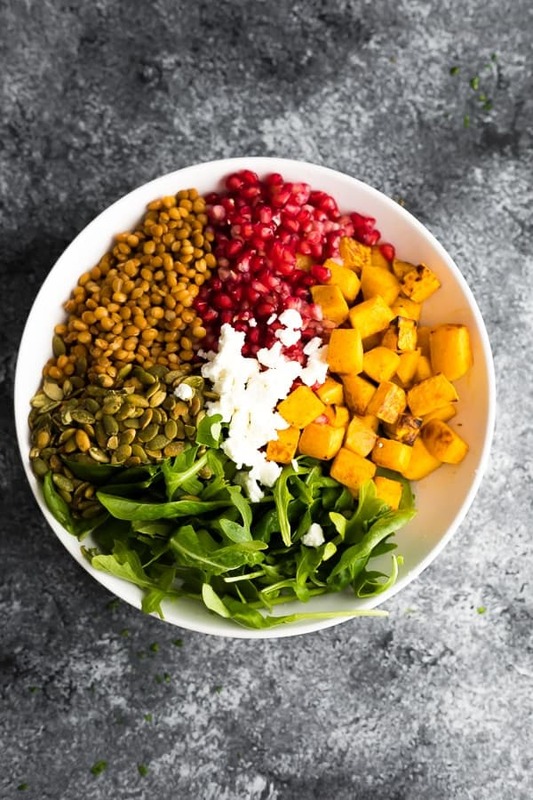 Havest lentil salad has roasted butternut squash, arugula, pomegranates, goat cheese and pumpkin seeds, and a tangy cinnamon vinaigrette. Make a meal out of it or serve as a side dish. Heat oven to 425°F. Toss butternut squash cubes with maple syrup, olive oil, cinnamon, paprika and salt & pepper. Arrange on a baking sheet. Bake in the pre-heated oven for 15 minutes. Stir the butternut squash cube up and flip, then return to the oven for another 10-20 minutes, until a fork goes into the squash cubes easily. Remove from oven and allow to cool before adding to the salad. 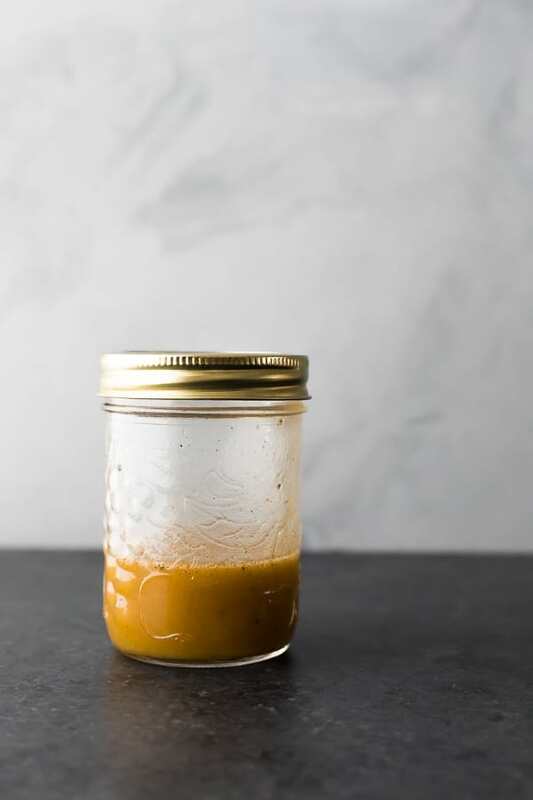 Shake together the vinaigrette. In a large bowl, toss together all salad ingredients except for the goat cheese. Sprinkle goat cheese over top and serve. 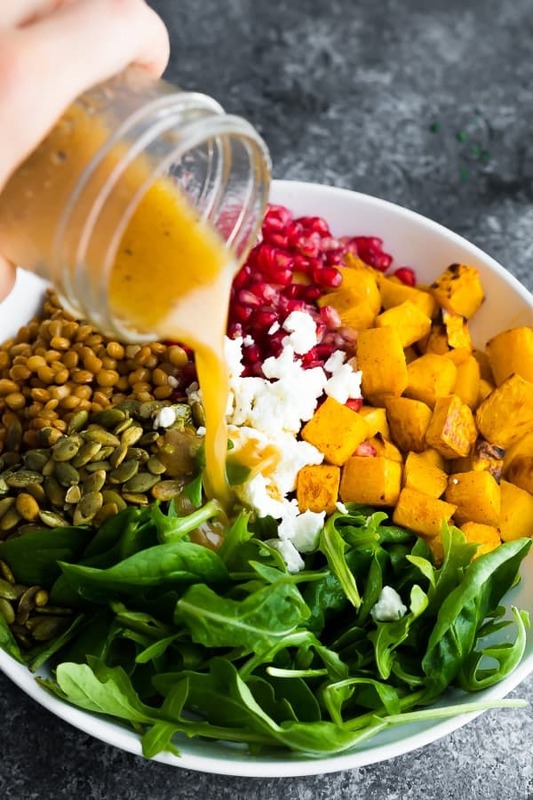 This salad does not keep well after the dressing is added but some ingredients can be prepped ahead: roast your butternut squash, de-seed your pomegranate and shake together the vinaigrette 2-3 days before serving.